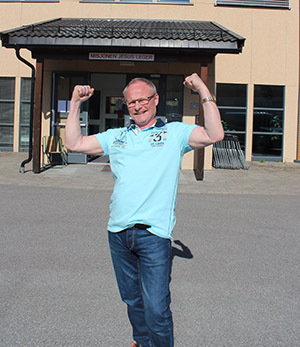 HEALED: For a long time Martinius Ingvaldsen had great back and sciatic pain. At a meeting with Pedersen the back was healed as he sat in the audience. For a long time Martinius Ingvaldsen had great back and sciatic pain. The reason was a serious back injury that the doctor would rather not operate. At a meeting with Svein-Magne in Vennesla the back was healed as he sat in the audience. Martinius Ingvaldsen is currently living in Staubø on Tverdalsøy in Arendal municipality. Originally, he grew up in Gratangen in Troms county, which is the neighbouring municipality of Narvik, which is incidentally Svein-Magnes birthplace. (More specifically Håkvik). As a young boy Martinius was unfortunate and injured his back. He and some buddies were playing in a gravel pit, but when Martinius was going to perform a jump, he landed incorrectly and was injured. -My back was so sore that I could not walk home. I therefore had to crawl along the side of the road, and continue onto the bus, and the 150 meters from the bus stop and up to the house. At home my mother helped me into bed. There I lay and I was in pain. Martinus says that that night he experienced something distinct. His mother had a Christian magazine that she laid under Martinius back believing that a miracle could take place. The next morning the back was completely healthy. -I felt no pain in the back after that, but the back however had obtained an injury. Several years later I visited the hospital regarding another operation. Then the X-rays showed that I had a back injury, and doctors were amazed that I had not had pain up until then. Around 2012 the back regardlessly started to hurt, and eventually the pain was more prominent. During 2014, it became increasingly painful. Martinus had severe pain in the lower back and hip, as well as radiation down the left leg. He eventually went to a physiotherapist where he got various exercises that would help the back. Nevertheless, the back did not improve, in fact it worsened. - Eventually I was sent to the hospital to have new x-rays of the back taken. The result was not pleasant. Some nerves were pinched, because a spinal disc had slipped. An operation would be complicated since the doctors would need to chisel away parts of the vertebrae in order to operate. Therefore parts of the back also had to be stiffened. This could make the back unstable, and the doctor was therefore unsure of what he was going to do. -You have a serious and complicated spinal injury. We prefer not to operate, but rather wait until you’re too sick and unable to function at all, the doctor said. Martinius’ condition only worsened, and he expected to have an operation shortly. He had severe pain in the back and down one leg. It affected his nightly sleep. Every night was ruined. - Furthermore, all the static activities were impossible to perform, such as standing in queues or everyday things like standing at the kitchen sink. It was also painful to walk on hard surfaces. Sometimes I got so-called panic pain. It was so painful that I just had to throw myself down on the couch to stretch out. After a few minutes it passed. This happened constantly. It was also hard to walk in stores and shopping malls. Sometimes I had to lie down on a pallet in the store to rest. The store clerks probably wondered what I was doing. If we were at IKEA, it became somewhat easier. It was all right to find a sofa to rest my back. Martinius mentions that the ailments also prevented him in the outdoors, something he was very fond of. It was very strenous for the back to walk downhill. -I stayed very still at this time. The doctor gave me a box of painkillers, but they did not help much. Besides, I was skeptical to such things, because I have worked in health care for many years, and I knew it was not good. On Saturday March 21, 2015, Martinius and his wife made the trip to Miracle Saturday in Vennesla. This is a meeting that Jesus Heals Ministries and Svein-Magne Pedersen arrange several Saturdays throughout the year. Martinius had been familiar with Pedersen’s ministry for a long time. He and his wife made a decision for Jesus during a meeting with Pedersen in Myre i Vesterålen in 2009. The miracle meeting in Vennesla continued throughout the evening. Svein-Magne prayed for people individually, and he took his time. While Martinus sat waiting in the congregation, he noticed that his back had become healthy and the pain had disappeared. When his wife was going to receive prayer, Martinius chose to stay seated. -It was actually after some days that I really became aware of what had happened. I noticed that all the pain was gone. The back had been healed while I was sitting in the sanctuary and without the laying on of hands. It was amazing! My wife could hardly believe it to be true. -In the time that followed I have been in fully active. I have climbed mountains and run through the forest. Recently we were fishing in Froland. Now I can enjoy life as before. I am one hundred percent healthy and I thank God for it. ROBUST: Today Martinius’ back is good as new. Here he shows how fit he is by turning cartwheels outside Jesus Heals Ministries Society’s healing center in Vennesla.